Experience classic design and smart technology with the TIGER SMARTwatch Rome. The attractive and stylish SMARTwatch Rome brings flexibility and freedom to your movements and personality. With a stainless steel silver wristband band and smooth clock face, the SMARTwatch Rome is sophisticated and elegant. Here is a watch that lets you stay connected and stay on the move. 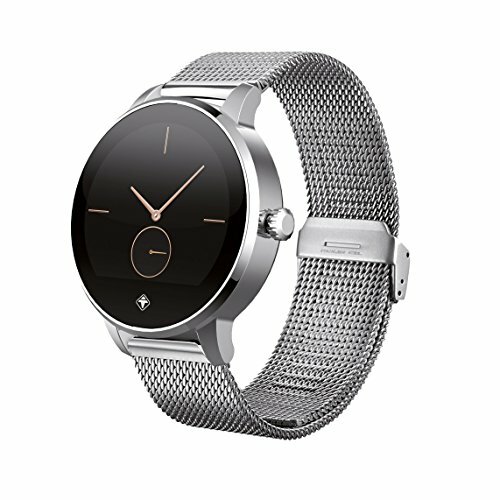 Featuring a built-in microphone and speakers, the SMARTwatch Rome connects to your smartphone via Bluetooth® Smart 4.0LE and 3.0 and gives you up-to-the-minute notifications, messaging functionality, and more; all while tracking your physical activity and heart rate. The SMARTwatch Rome is designed with your health in mind providing an optical heart rate sensor and TIGER smartAPP for Android 4.2 and iPhone iOS7, to track the progress of your daily fitness goals. The brilliant camera trigger turns the smartWATCH into a remote control for your smartphone’s camera so you can capture awesome shots simply by pressing the shutter button on the clock. Stick to all sporting activities without worry because the smartWATCH is conveniently water and dustproof to IP66. The watch has a 1.22 inch capacitive IPS touch screen and uses a 300mAh battery with a lifetime up to 3 days. It’s time to be yourself with customizable watch faces and wallpapers to match your unique personality, style and mood. Improve your life today with the TIGER smartwatch Rome. Smartphone on your Wrists: Connects to your smartphone via Bluetooth so you can get all notifications like e-mails, text messages, phone calls, and updates right on your wrists. Stay Active and Connected: Built-in microphone and loudspeaker let you stay on the move while conducting important, casual, or fun conversations over the clock. Don't Miss the Beat: Heart rate sensor measures your current heart rate and TIGER smartAPP measures your workout with integrated step counter and activity tracker. Capture the Moment: Remote control your smartphone's camera from your wrist to capture awesome shots simply by pressing the shutter button on the clock.